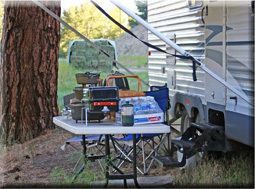 RV camping allows you to bring all the convenience of home. 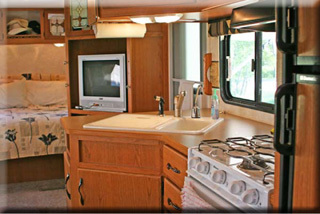 The preferred campsite for an RV comes complete with power, water and sewer hookups. 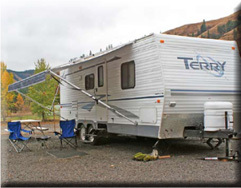 This allows all the conveniences of your RV, although the RVs are self-contained with battery power, generator, fresh water holding tanks and even a septic tank. However, these are usually only good for a three or four day stay. My trailer comes complete with an awning which provides an outdoor lounging area, a great place to set up those folding chairs and tables, and also an outdoor cooking facility. I like to set the RV in a level place. 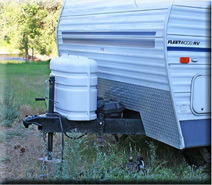 The RV comes with leveling jacks and even a bubble level to help precisely level the unit. I prefer the trailer because it’s towed by a separate vehicle. Once the trailer is in camp, the vehicle is free to run around in. When camping in a motor home, you must drive the whole thing around if you need to go to the store, and you may lose your campsite while you are gone. I like to park my RV in a place that’s close to the recreational activities I plan to enjoy while camping. I also like to pack along a separate screen tent, an extra tent, and additional sleeping bags. 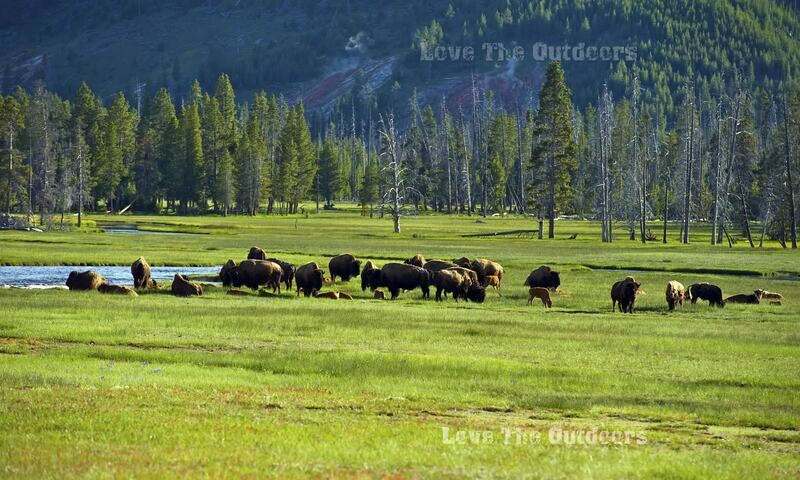 We commonly have family members and neighbors that want to visit. In the rear of my trailer my hookups, including the electricity, the fresh water, and the septic hose, are all located in one area. These are attached to the campsite’s hookup amenities. With these hookups I don’t have to recharge my battery or use my noisy generator. 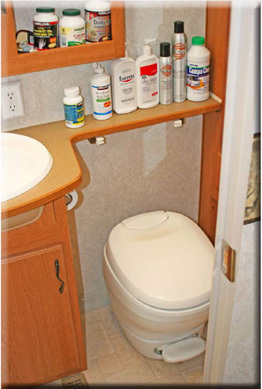 At the rear of the trailer, a compartment opens and provides an exterior shower complete with hot and cold running water. Here I can wash items such as muddy wading boots, dirty dogs, and the like. 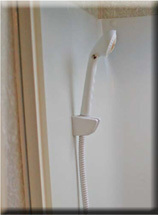 You can also use this as an exterior shower. This is great for swimming trips. A ladder is located at the back of the trailer which allows access to the roof rack where lightweight bulky items may be stored. This is a great place to carry that pontoon boat or white water raft. The roof also has a television antennae and air conditioning unit. The front of the trailer contains the jack. This is useful for leveling the fore and the aft tilting of the parked trailer. It also contains the trailer hitch for towing the vehicle. Under cover it also has two large propane tanks and two deep cycle batteries. This provides for heat and power. This front of the trailer is where I put the leveling ball; it’s here at this jack where the fore and the aft are leveled. The same leveling ball is used to adjust the port and starboard angles. All four corners of the trailer have additional leveling jacks. I like to use wooden blocks to place between the leveling jacks and the ground to precisely level the trailer. The freezer and refrigerator work most efficiently when the trailer is level. If the unit is tilted, the refrigerator unit does not work as well. Another obvious reward of a level trailer is that you won’t roll off the bed. You also don’t want the soup to slip onto the floor. The deep cycle batteries are charged from the vehicle’s alternator when it’s running. It also receives its charge from the electrical hookup because the trailer has a built in trickle charger. 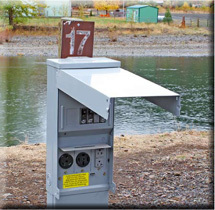 The fully charged batteries provide backup security in case the electrical hookup is lost. I enjoy a large folding table that sets up under the awning. On it I can store my outdoor barbecue grills, Dutch ovens, and gas stove. During warm weather you can enjoy cooking outside without heating up the living and sleeping area. With this setup it’s just like barbecuing on the deck at home. 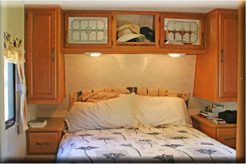 Inside of our travel trailer we have additional living space because the slide out extends outwards. This greatly increases the width of the living and cooking areas. This slide out is a real advantage for comfort. In the slide out we have a full length sofa that’s a hide-a-bed. We also have a dinette set that has seating for four. An AM/FM radio/CD player provides surround sound with its extended speaker system. Large windows provide views of the great outdoors. Also there are bookshelves above and additional storage underneath the chairs and sofa. You can organize lots of gear and keep it readily available. The lighting is either from the battery or the electrical hookup. The trailer has a thermostat that can precisely control the temperature. It controls both the furnace and air conditioning units. The bathroom contains a tub and a shower, a sink and vanity, a large wardrobe closet and chest of drawers; it also has a toilet. The bathroom door has a full-length mirror. A large pantry is adjacent to the refrigerator. 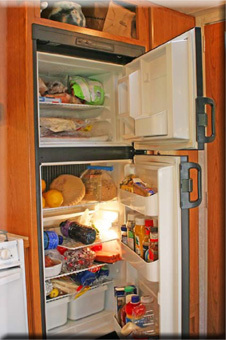 The refrigerator consists of an overhead freezer and separate refrigerator compartment. This refrigerator runs off of propane, deep cycle battery, or alternating electrical current. It automatically selects the prominent source of power. 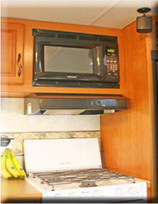 A microwave is above the light and fan which is over the gas stove. It’s complete with a conventional oven and three gas burners. Overhead there are many kitchen cabinets with ample storage and pullout drawers and cabinets. A dual sink provides water and a separate filtered drinking water faucet. A handy cutting board sits over one of the dual sinks. The kitchen is an ideal size because it’s easy to clean and keep organized. The large windows also come complete with blinds and pull curtains. The windows can be opened and they are screened. The dinette set also makes into a double bed for guests. A sliding partition divides the kitchen from the sleeping area. The main bedroom consists of a queen bed on a box mattress. The bed has additional storage under the mattress to store your valuables. The bedroom also consists of reading lights, two large wardrobe closets and two sets of drawers with overhead storage compartments. The entertainment system consists of a television, DVD player and VHS player. There are large storage areas for your favorite tapes and DVDs. We enjoy bringing along our favorite classic movies to re-enjoy. To increase the comfort of the queen bed mattress, we have put an additional waffle foam insert on its top. This provides for better sleeping. I like to place an outdoor carpet underneath the steps to the entry of the trailer. Here you can take off your shoes and not track the dirt inside. A small broom and vacuum cleaner system make housekeeping a snap.